Now, torn between her love for Tucker and her complicated feelings about the roles she and Christian seem destined to play in a world that is both dangerous and beautiful, Clara struggles with a shocking revelation: Someone she loves will die in a matter of months. With her future uncertain, the only thing Clara knows for sure is that the fire was just the beginning. 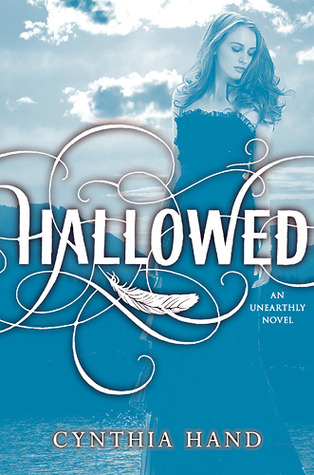 In this compelling sequel to Unearthly, Cynthia Hand captures the joy of first love, the anguish of loss, and the confusion of becoming who you are. Thanks to Betty for saving this series from the series plague! Clara realizes that she and Tucker are likely doomed considering her destiny is telling her she belongs with Christian. Regardless, she is hell-bent on being with Tucker, even though she fantasizes about Christian. She has more visions. Someone important is going to die. The more Clara learns about what it means to be an angel, the more confused she becomes. Clara’s vision: Cemetery, Christian holding her hand, Tucker is not there– crap, is he dead? !, oh and sorrow, always sorrow! Christian– REALLY HOT ANGEL BOY– is in love with Clara. He supports her unconditionally and is a perfect gentleman, yet Clara isn’t interested in giving things a shot regardless of their deep connection. She loves Tucker and wants to make things work. Angela starts Angel Club– Clara, Jeffrey & Christian meet every day after school to practice their skills and share their knowledge of all things angel! With Christian’s help, Clara is able to put the pieces together that form her vision. Her mother (Maggie) will die. She is 120 years old, which equals angel death. Clara & Christian have a SUPER HOT, INTENSE, ELECTRIFYING KISS that freaks her out because she is supposed to be in love with Tucker! There is an angel congregation! They have a giant pow-wow to discuss what will happen after Maggie’s death. Maggie keeps information about their confrontation with Samjeeza from the congregation. Clara doesn’t know why. Turns out Clara’s father (Michael) isn’t just some average Joe after all. He is an Intangre!! YES… A FULL BLOODED ANGEL!! This means Clara & Jeffrey are actually Triplares, which are very rare. Only 7 Triplares walk the earth at a time. This is dangerous because they are very powerful and Black Wings want them on the dark side! Clara bonds with her father as they prepare for Maggie’s death. She dies. Clara and Jeffrey go through serious grief. Samjeeza is at the funeral. Clara goes to him and gives him a charm bracelet that belonged to her mother. He is touched by this act of sympathy. Tucker tries to comfort Clara. She tells him about the kiss. Tucker and Christian have a fist fight! Jeffrey tells Clara she screwed up his purpose. Turns out he was supposed to set one of the fires and save Tucker!! It’s graduation day. Everyone talks about their plans for summer. Clara plans to go to Italy with Angela. Christian will be off training. Jeffrey takes off because the police found out he set one of the fires. Tucker apologizes to Clara for the fist fight and tells her he’d like to hang out before she leaves for Stanford in the Fall. Clara’s father (Michael) takes her to Heaven to show her that her mother is okay. It gives her a sense of peace.